One of the most recognisable and established brands in the UK, Kettler are synonymous with high-quality products ranging from garden furniture to bicycles to fitness equipment. They’re one of the few (dare we say the only??) brands in the industry that still manufacture products in Europe. They’ve got an excellent reputation and have, in the past, brought to market some very good machines. 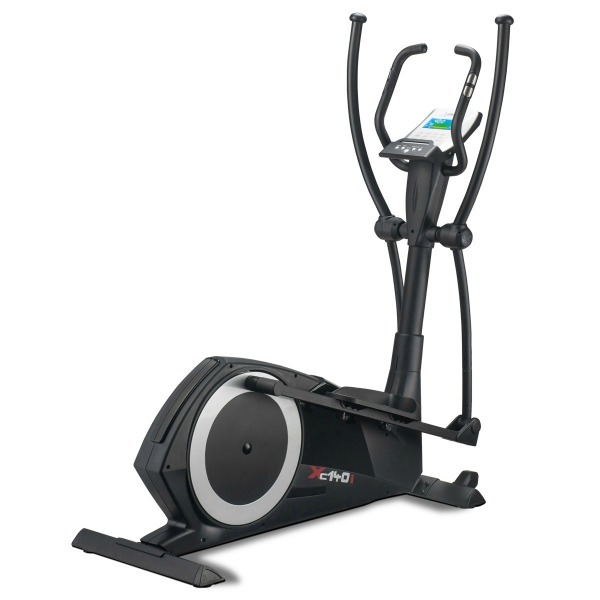 Which is why when we got the chance to test their Skylon S Folding Elliptical Cross Trainer which is built in Germany we didn’t hesitate to get one in. As always, assembly is the first workout that anyone gets with a new cross trainer. Whether that’s an enjoyable workout or not depends entirely on the quality of the machine and we weren’t in the slightest bit surprised (though very happy) to find that the Skylon S goes together exactly as you’d expect a German machine would do. The bolts are machined properly and everything lines up the way it’s supposed to. It all goes together exactly as the clear and logical manual says it should. No excessive pressure required, no bolts or screws left over, no unsightly or uneven gaps. The Skylon S has clearly been manufactured to a high standard and having gone through the assembly process, before even getting on it, it’s obvious that parting with your hard-earned has not been a mistake. Assembly is definitely a 2 person job and will take most people between 45min to an hour. The Skylon S doesn’t just fit together nicely, it looks good too. Kettler have avoided the dreaded ‘fitness machine grey’ here and gone for jet black and silver/chrome with a bright blue trim. 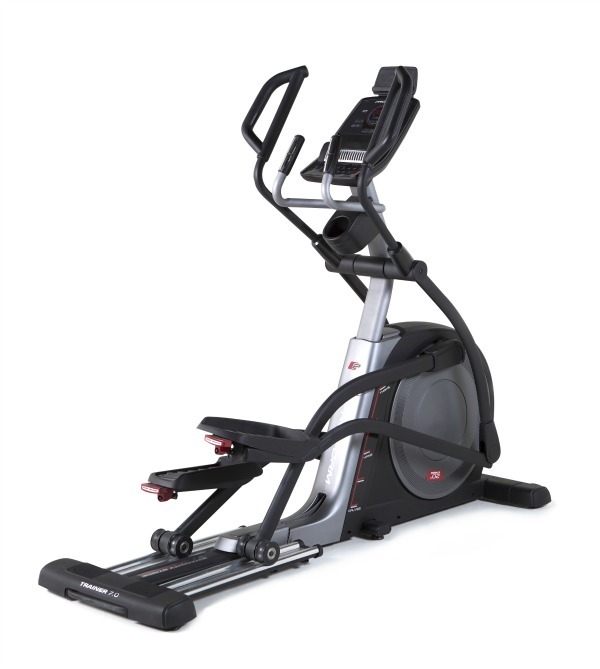 The end result is a very modern looking elliptical that oozes quality right off the bat. 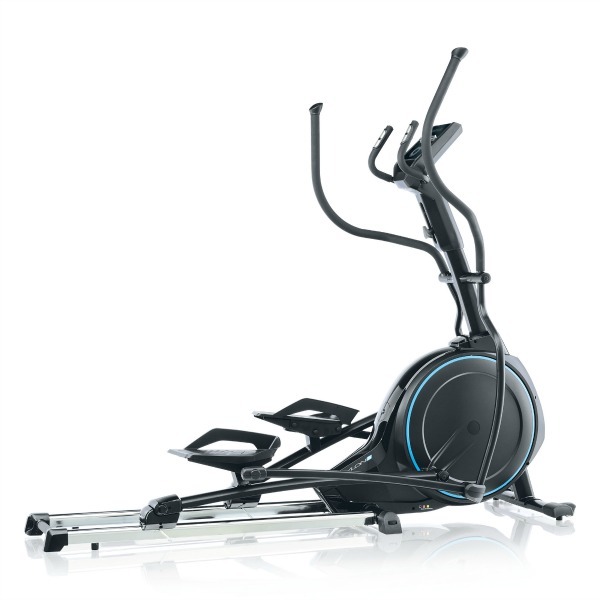 The most important aspect of any fitness machine, but usually more so on an elliptical than any other type of machine is the feel of the thing, and the action on the Skylon S is nothing short of superb. Smooth and quiet, it’s steady and uniform throughout the entire cycle. No annoying squeaks here. No unwelcome vibrations or rattles. No wobbles, grating sounds, clunks or clicks. Just a very smooth, comfortable ride which, no doubt, has the enormous 22kg (48.5lbs) flywheel and the 19.7” (50cm) at its heart. That flywheel really does deliver a great ride. All that weight ensuring that as you get to the point of no return in the cycle there’s no change in speed unless you demand it. Kettler have clearly not skimped on the components either. The bearings are high quality and combined with that heavy flywheel, the Skylon S feels as good to use as that ‘made in Germany’ tag will have you expecting it should. 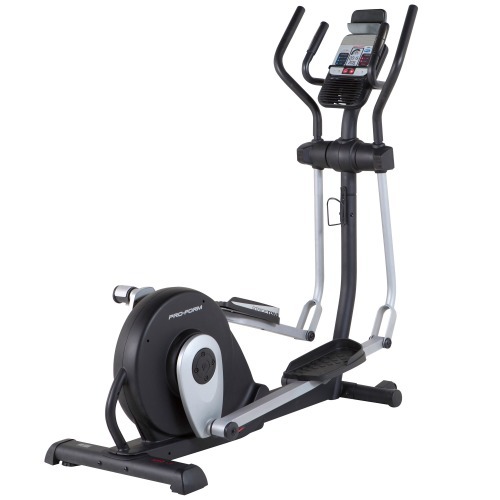 That 19.7” (50cm) stride also means that this elliptical is well suited to most users. As some of you will know, we have a varied profile of people here at ECTR towers 🙂 Everyone in the office found it comfortable to use regardless of height and even with the larger of us trying to hammer it, the Skylon S simply absorbed the pounding, seemingly without breaking a sweat (which is more than that can be said of some of the people on it!). All very reassuring. Another reason why it’s so comfortable is the console height adjustment mechanism. Just loosen the knob on the main stem a couple of turns and then slide the console up or down the front post until you get the desired height, then just tighten again. Simple and quick this feature is very effective at ensuring that you’ve got a good view of the control panel and also, as it has a tablet holder, your tablet screen. The fixed handlebars also move up and down with the screen providing a comfortable and secure grip regardless of your stature. This is sure to appeal to households with multiple users, especially so if there’s a significant height difference between the people needing to use the machine. The pedals are also very tightly positioned close to one another. With a Q Factor of just 6.5cm (2.5″), providing a very natural, comfortable feel when using it. We’d be remiss not to highlight the folding mechanism here. 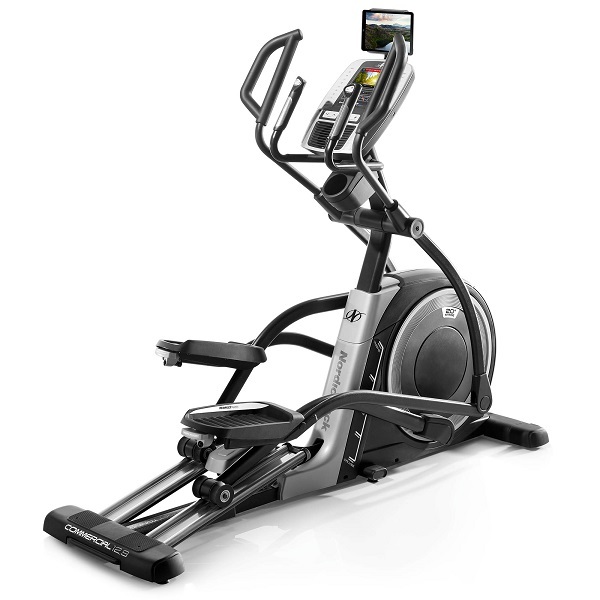 The way of doing this on the Skylon S is by far and away the best that your reviewer has come across on an elliptical. 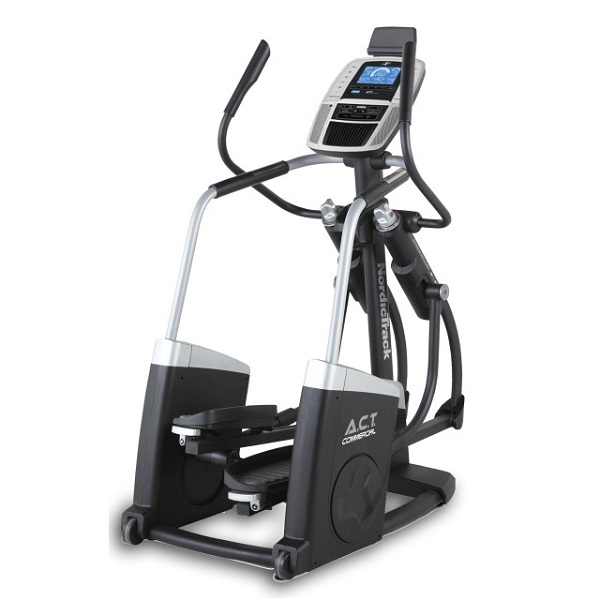 It’s actually much closer to a treadmill in many ways than anything seen on numerous other folding ellipticals. For starters, the whole thing folds up and down in one movement. 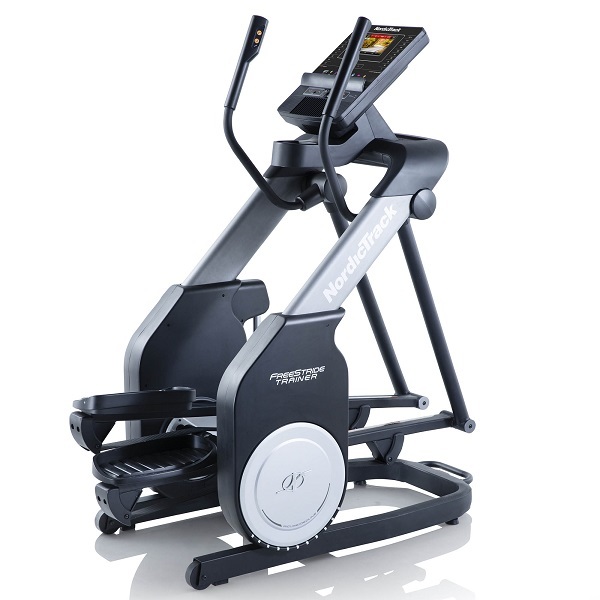 On most, if not all, other cross trainers that have the flywheel at the front, folding involves first attending to one side and then the other, securing each side in turn, then subsequently doing the whole thing in reverse again. For this reason, it’s typical for owners of such machines to stop folding them up and down after a short honeymoon period. It’s simply too much trouble to keep doing it over and over, making the folding aspect something of an irrelevance. Kettler have solved that problem with the Skylon S. Just take hold of the bar at the back , release the catch built into the left hand side and lift until the catch clicks. To unfold again, push forward a touch, release the catch and lower the bar then let go and it softly touches down. That’s it. The whole thing moves as one piece. 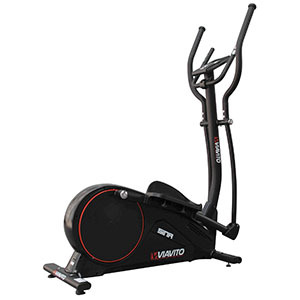 It’s brilliant in its function and simplicity and surely the template for all other ellipticals that have aspirations to fold! 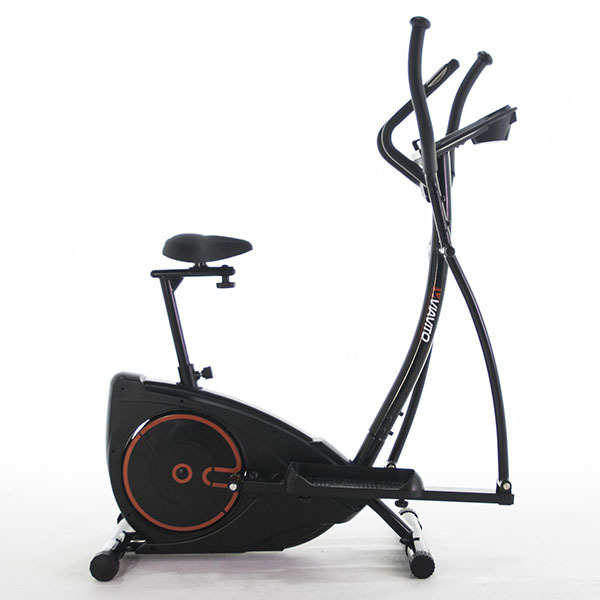 So it’s comfortable, well built, adjustable to suit most people’s height, feels great and folds away – that’s all the mechanical bases covered but what about the electronic side of this machine? As you might expect and have probably already guessed, the Skylon S does not come up short. First off is the resistance system. Kettler have employed an electro-magnetic brake here. Resistance is adjusted in 5-watt-increments from 25 to 400 Wat. This is something that is most welcome and results in superior response times to resistance adjustments. As there’s no servo motor the speed of the resistance change is nigh on as quick as pressing the button (not quite as fast, but very close) due to the fact that the magnet doesn’t need to move. Simply put more electricity through it and the electromagnet becomes stronger. It’s lightening quick and makes the Skylon S ideal for anyone wanting to perform interval or cardio training. It should also translate into a longer life as well as better reliability than cross trainers that rely on servo motors to move a magnet closer and further away from the flywheel. Needless to say all the basics are covered such as Polar compatible wireless receiver for use with the chest strap that’s included but the console, while looking small is actually packed with features. The touch sensitive glass surface on the console just adds to the feeling of quality and the display is nice and clear. The interface on the console is laid out logically and there are refreshingly few buttons, making it feel friendly. The console itself features manual and heart rate control programs. Very simple but very slick too. The ‘Pulse Hold’ function is just about as easy as it’s possible to get on a heart rate control set up. Get on the machine, start your workout and build your pulse rate up to where you want to keep it, then press the pulse hold button on the console. From then on the Skylon will automatically adjust the resistance to keep your pulse at that rate. If your pulse goes too high, it’ll slacken off. If it goes too low, it’ll make life more difficult. Simple and very effective. As you’d expect, the console also provides feedback stats such as pulse, RPM, watt expenditure, time elapsed. The console is Bluetooth enabled and there’s also a USB charger built into the console so you can keep your device charged during your workout. The KETTMaps app is a fantastic tool that gives you loads of interactivity and quality training options, and offers lots of video training content in the Kinomap portal, all accessible via your smartphone/tablet. Other nice little touches include water bottler holder which is often overlooked on ellipticals and a strap to prevent your device from getting jogged off the console during your workout (not that you need due to the elliptical being so solid and stable) . With a max user weight of a whopping 150kg (23.5 stone) the Skylon S will take just about all the punishment you can throw at it and with all the adjustments mentioned earlier is suitable for just about everyone. Try as we might we can’t fault this cross trainer. It’s genuinely one of the best ellipticals we’ve tested in recent memory and we really can’t think of anything we don’t like about it. Not only is it solid, when folded it saves a good deal of space too. So it’s not going to hide in your living room but that folding mechanism really does make it simple and effortless to get it down in size so that it doesn’t dominate the room and sits nicely in the corner. There’s an old saying “you get what you pay for”. Never truer than here and as far as value for money is concerned the Kettler Skylon S really is worth every penny. The Kettler Skylon S is not currently available from any retailers we're aware of in the UK. 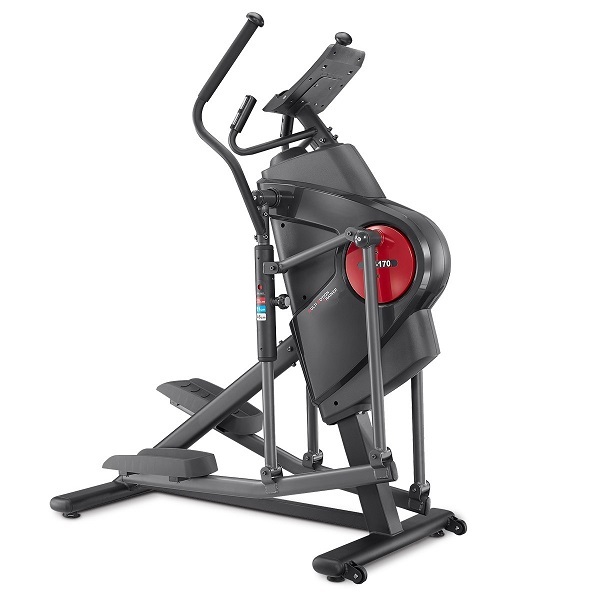 The Kettler Skylon S is definitely one of the nicest, smoothest, well-thought-through well-built ellipticals we've tested recently, the action and feel of it in motion is superb. 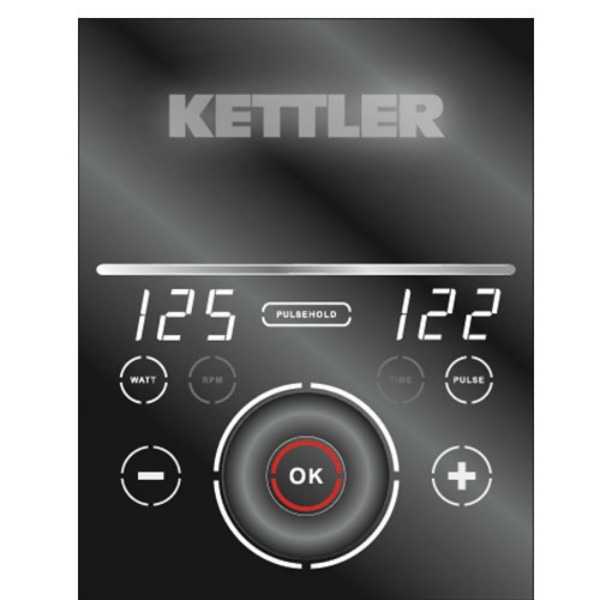 If you're looking for a machine that's not going to need replacing anytime soon, that's going to deliver where it counts and that's silky smooth, we'd highly recommend the very impressive Kettler Skylon S. It's normally good value but at the current price it really does represent great value for money.